Hey, 2018! It’s nice to finally meet you. There was a ton of hopeful lead-up to your arrival, and so far, besides the whole Tide Pods thing, it seems warranted. Look, I realize this is about four weeks late – you’ve been here awhile, and I should’ve acknowledged you sooner. But bro, I don’t think you understand how intense several consecutive weeks/weekends with family visitors is. Towards the end I was gently weeping in a tepid bathtub every night, wondering when it would end. It’s okay, though. Life’s back to normal now. I’m back to normal now (mostly). And I’m just really, really glad you’re here. I am gonna be frank with you: you’ve got a tough act to follow. Your predecessor was probably the best one of you yet, bringing all sorts of achievements and newness and terrifying, exhilarating leaps. That might seem like needless bragging but I didn’t actually realize how amazing 2017 was until I typed all of that out. It’s super easy for me to get bogged down in the stuff I didn’t yet accomplish, like losing all of the baby weight, or getting anything creative published, or figuring out what exactly to do with this blog. But it’s good to focus on what you have done every now and then, you know? lose the damn baby weight, it’s been 9 and a half months. I don’t even think that counts as ‘baby weight’ anymore. run a 10k – yeah, that’s right, I said it. Double or nothing. Here’s to a good year, 2018. And to anyone reading, take the time to focus on all you’ve accomplished – in the last year, in the last month, in the last week. Write it down, smile at the words, bask a little. It’s easy to forget how much we’ve done in pursuit of how much we have yet to do; don’t let yourself get bogged down in disappointment. Just do. 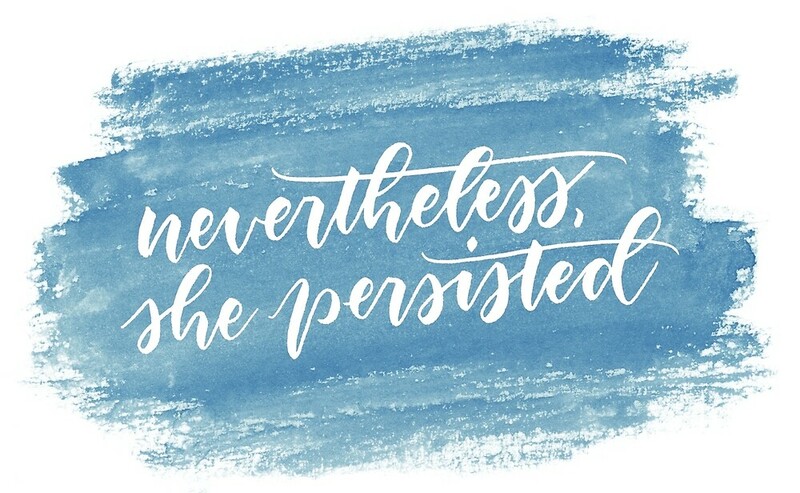 Just persist. Even a little progress is progress, and there’s still so much year left.